Opposition Leader, Bharrat Jagdeo on Thursday backed President David Granger’s Emancipation call for entrepreneurship, self-sufficiency and education, but took umbrage at the Guyanese leader’s admonition that they should be ashamed if they do not work. “This is the duplicity, the double-standard. Government is just borrowing, taxing all of that- the same ordinary people and so I agree with urging people to do better and study and all of that and to create jobs is good and I support the President on that but not the lectures and not the duplicity. People see it all the time, how they are living the good life; a small group of them and the entire country, including many of those kids who were there,” he said. 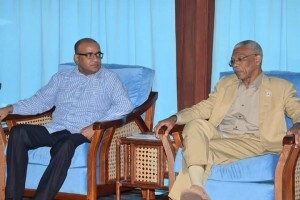 Jagdeo was reacting to a speech by Granger on Tuesday night, Emancipation Eve, at Beterverwagting Village, East Coast Demerara in which he urged residents not to depend on handouts, curb liming and instead focus on self-employment such as agriculture and education to prepare them to secure jobs in the emerging oil and gas sector. Jagdeo accused the more than three-year old coalition-led administration of scrapping a number of initiatives such as collateral-free loans for women that his People’s Progressive Party Civic (PPPC)-led administration had put in place to boost entrepreneurship and employment among women and youths. He said the Granger-led administration was busy spending millions of dollars on constructing fences and repainting buildings in green, increasing the cost of vehicles by more than GY$1 million because government has banned vehicles more than eight years old, and frustration of agro-produce vendors at the Stabroek Market area whenever there is a national event. He also alluded to a tax on farming implements and other inputs as a disincentive to farmers returning to the land Jagdeo also referred to the imposition of a 14 percent Value Added Tax on education that was withdrawn only after pressure. “Stop building arches, stop painting buildings green if you are going to lecture us about people taking a drink at the Guinness Bar and spend the money where it will genuinely create the jobs for people and the economic emancipation,” he said, adding that ordinary people were now being taxed even as they were being asked to create jobs. Jagdeo chided Granger, saying that as a historian the President should have been aware that in the post-slavery period a lot of persons did not get government support and instead create jobs in the private sector. However, in post-Independence Guyana, the village economies were “destroyed” and most people were encouraged to work with the government. “The government sector grew and the private sector and the village economy shrunk so people were then encouraged to work- go into the army, police, etc. The public sector grew large and we destroyed entrepreneurship and the village economies,” he said. Reflecting on the period after then President Burnham died in 1985 and his successor, Desmond Hoyte, abandoned the socialist experiment in favour of an IMF/World Bank Structural Adjustment Programme, Jagdeo said by that time in 1992 public sector minimum wage was US$25 per month. “We had pauperised an entire middle class because the entire middle class, at one stage in the 70s, the public service was the middle class in Guyana and was primarily Afro-Guyanese and by 1992 that middle class was totally pauperised by the Structural Adjustment Programmes that they pursued,” he said. The former Finance Minister observed that then the Guyana dollar had depreciated, inflation was high and the country had been declared bankrupt. Jagdeo added that in 1992, entrepreneurship would would not have been feasible because interest rates were 38 percent and inflation was 70 percent which would have required a 100 percent rate of return on investments to pay interest rates and earn revenue that would not have been absorbed by inflation. “He should have known this if he had done a proper technical assessment of the growth of entrepreneurship including in our Afro-Guyanese communities,” the Russian-trained economist said. The Opposition Leader, who served as President from 1999 to 2011, reiterated the need for the Ethnic Relations Commission to conduct a fact-based assessment of Guyana’s entire post-independence period about the state of Afro-Guyanese. The ERC has said that Jagdeo has not formally requested the ERC to conduct such an assessment.